Major tree pruning operations can also be carried out by our tree surgeons as and when required. GRITIT tree pruning ensures that you comply with the Highways Act 1980 Section 154 in removal of all low branches. 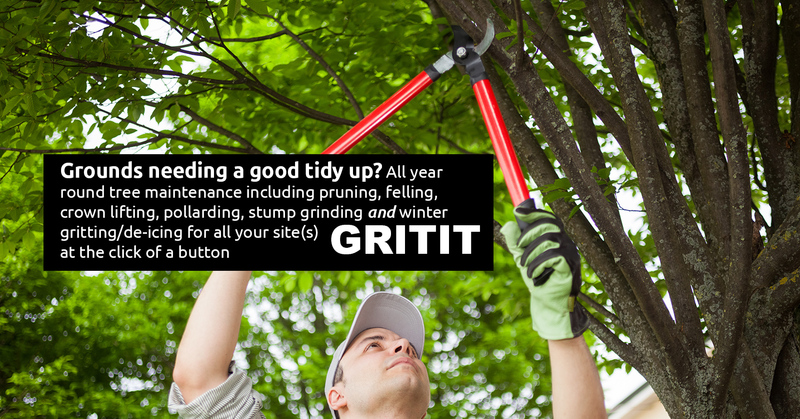 A long-term pruning plan with GRITIT ensures that low branches are always removed to ensure a clearance of 2.4m over paths, 5m over roads, 1m from all street lighting, traffic signs, traffic lights, street name plates and 2m from windows or adjacent premises. At GRITIT we believe that trees and shrubs have a natural form to them and generally do better and look better if left alone. Each kind of tree has its own characteristic shape or growth habit and when pruning, and we work hard to maintain that beautiful look. There are times, though, when pruning is necessary for safety and longevity reasons and proper procedures need to be followed - therefore all our tree operations are carried out in accordance with British Standard BS3998: 2010 for Tree Works and all our team members are trained and qualified to the appropriate standard.